Abounded. Abundant. Full to the brim and flowing over the top, with no end in sight. God loves lavishly; He gives us wisdom and prudence. He lavishes the wisdom of His Word on us, and through it, and the blessing of the Holy Spirit, we can also abound in wisdom and understanding, prudence, insight. Do you know someone who just seems to have a deep understanding of the Word, and who can always point you to a principle or an answer to your question? That person has tapped into the abundance of God’s wisdom and prudence. There is no problem for which God’s Word cannot provide direction. It is the Word of God! In all the ages that have passed since the first book of the Bible was written (that would be the book of Job, by the way) evil, godless people have done their best to destroy it. What they don’t understand is that God, and His Word, can never be destroyed. Never. It may be suppressed in some times and places, and that effort is being made in my beloved America today. It’s not going to prevail, not forever. God’s Word has stood the test of time, and it always will. It is the basis of our faith, and it will not be destroyed. God’s wisdom and prudence abound to us through His Word. It is the best treasure anyone could ever have. All that we have in the first six verses of this chapter is through no works of our ow; it is only through the shed blood of Jesus Christ, and His resurrection that we find forgiveness of sin. 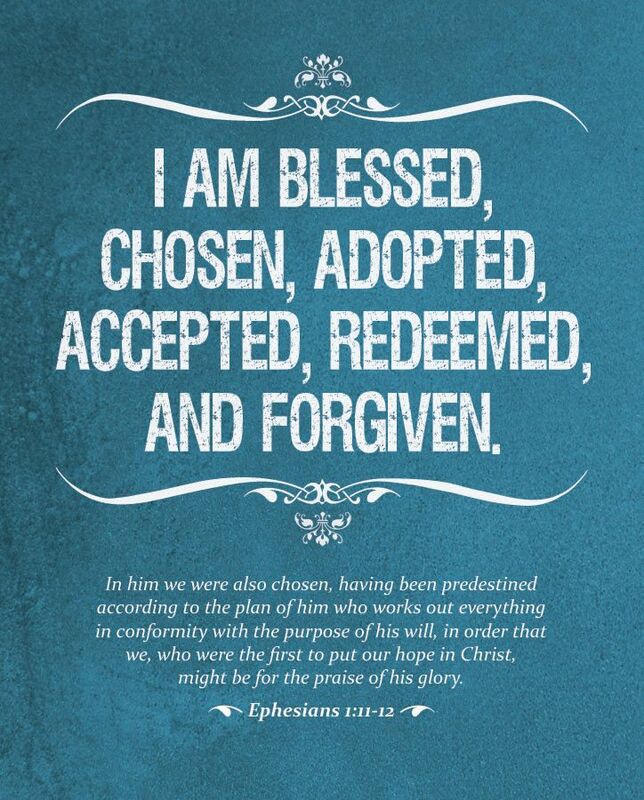 It is only through the fathomless riches of His grace that we are accepted in the Beloved. The wrap-up to this incredible section of the book of Ephesians is one of my favorite verses. 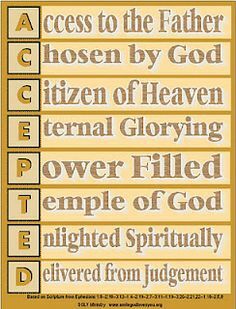 Because of His glory and grace, we are accepted in the Beloved! No power of our own could have wrought such a miracle. There is nothing we have to offer that makes us worthy of His love and acceptance; only the blood of Jesus Christ, His death and resurrection, could have worked to cleanse us so that we are acceptable to a holy God. The only view God has of me is through the blood of Jesus! Pkease notice that starting with verse 3, and ending with verse 6, it is one long sentence. This is all one topic, one thought, divided into verses not by Paul but by the translators who would later separate his words into verses, mostly for the sake of making things easier to locate. Those translators did a pretty good job, over all, but we need to read it as Paul meant it to be read and understood. I am using the separate verses to break it down for the sake of brevity, and paying attention to the details. Tomorrow we’ll finish the sentence, and then I hope you’ll go back and read it in its entirety. Long before the world was made, by our reckoning of time, God chose us in Christ to be with His Son for all eternity. The entrance of sin into His perfect world did not change His purpose, which He worked out according to His own grace. This grace is available to all, unconditionally. Have you ever watched a horde of little kids at an Easter egg hunt? The eggs are out there, free for the taking. Some kids seem to have perfect vision, and eagerly rush about filling their baskets. Others tend to run right past eggs lying there in plain view, and some return to their parents empty-handed because they just could not see what was right there. That’s kind of the way we are. Some of us, seeking relationship with God, find it quickly and easily. Others hunt longer because, perhaps, they had a picture in their minds of what it would look like, and they didn’t find that specific picture. Others go empty-handed because they rejected what was in plain sight, even though they could have taken it easily. It wasn’t what they thought they wanted, so they passed it by. Revelation 22:17 says, “Whosoever will, let him take of the Water of Life freely.” The invitation is open to all, but not all accept it. Once a person does accept that invitation and enters the door of salvation, he finds written on the inside of the door, “Chosen in Christ before the foundation of the world.” God always had His heart fixed on any who would open the door, but we don’t find that out until we go inside. It is also just not true. ALL are chosen of God; not all choose Him in return. It is only when we respond to His invitation and come to Him for forgiveness and salvation that we understand that we must choose Him in response to His having chosen us. The blood of Jesus was shed for all, not just for those who accept it. 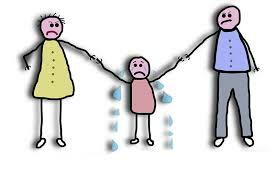 The reason not all enjoy the benefits is because they do not choose to receive them. So when we choose to love God and accept His invitation to eternity with Him, we are adopted, according to His predestination for us, and according to the good pleasure of His will. 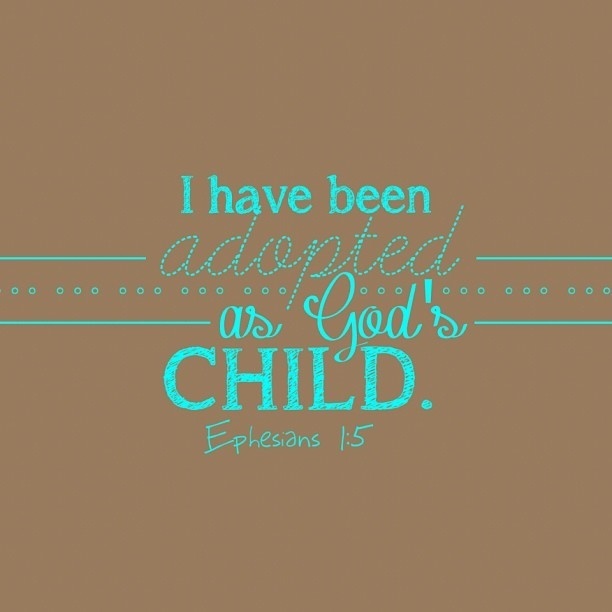 Adopted as joint-heirs with Jesus Christ into all that heaven holds, because we chose Him. It’s a late Sunday afternoon,a gorgeous October day that makes my heart squeeze. The light here in October is just perfect. The blue of the sky intensifies, and the colors are amazing. It’s a paean of praise to the Creator, and a reward to us for enduring the dog days of August. I truly love fall here in my corner of PA. I just wiped up the kitchen, after loading up the dishwasher. I have a new kitchen, which any of you who have been with me for a while know all about–probably in too much detail. I really love my countertops. Granite, in a pretty pattern called Kashmir White–or maybe White Kashmir, I don’t remember. (This is not my sink–just a stock picture I pulled of Google images, but the cabinets below are pretty much the same color as mine.) They clean up so quickly and easily, and they’re very forgiving. Right now, I’m enjoying a cup of orange tea sweetened with a teaspoon of honey (gotta watch those carbs!) as I listen to the dishwasher do its dreary chore for me. This is the first time I’ve ever had a dishwasher that really works, and I love it. I think even Terry is becoming convinced it was a good idea. The kitchen’s not quite finished because there is lots of outdoor work Terry took care of in the good weather, but he’ll get back to it when he can’t be outside any more. I’m also thinking about my church this afternoon. Our pastor and one of our deacons are visiting missionaries we support in Mozambique, so the assistant pastor and a couple of other men are filling the pulpit. We have an unusual number of biblically sound, gifted-to-teach men in our church, and I love it. We are blessed, for a relatively small church, with so many godly men who lead their families well. My son-in-law is one of them. And speaking of kids (that was a pretty good segue, don’t you think?) I really love going into the church on Sunday and seeing three bright and shiny faces smiling at me. “Hi, Grandma! Is Grandpa here?” All my grandchildren hold their own special places in my heart, and they will only understand that when they are grandparents themselves, if the Lord tarries. We got news yesterday that our South Dakota family will be here for Christmas! Can’t wait! Can’t even think about it too much or I just get too wound up. and adjusts to fit my stumpy little legs. So thank you, Lord, for helping us find the right one and making it within our price range. The test of how good it is? After I’ve been sitting for a while and then I need to stand up. So far, I’m making that manuever without sounding and feeling like a ratchet wrench. Along with many of my contemporaries, I’m fighting the Type 2 Diabetes scourge. I’ve started swimming a couple of times each week, which should help my back, as well. I’m counting carbs, and doing pretty well at losing some weight and realizing how much I was overdoing it on the carbs before. We drove past a Dunkin’ Donuts on our way home from church, and there was a line of cars circling it like an army of ants. “Go ahead!” I hollered, to Terry’s utter amazement. “Stuff your faces with all those empty carbs, give yourselves diabetes and a belly ache! I’m driving right on by!” Truth? I’m green with envy. I love donuts. I want donuts. I’m not getting any donuts. If I think about it, I get really cranky. So in a little while I’ll go have a small apple with some cheddar cheese or a little peanut butter, and I’ll convince myself it’s just as tasty as a donut. Yeah. But don’t I feel better now that I’m getting some exercise and staying away from all that sugar? I don’t know. Maybe. Ask me again in January after I get my next A1C number. For those of you who are not diabetic, be thankful you don’t know what A1C means. And lay off the donuts.